Get more out of your panoramas, slideshows and travel route animations. MAGIX , One of the leading international providers of software, online services, and digital content, has announced the release of MAGIX Photo Manager MX Deluxe. Faithful to the Media-X-Change (MX) philosophy photos can be directly transferred to other MX series programs using the "Share" button. For example this allows projects to be transferred to MAGIX PhotoStory on DVD MX for editing. 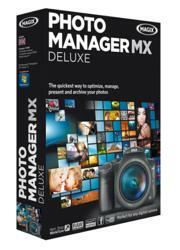 MAGIX Photo Manager MX Deluxe doesn't just get image collections into shape! It also offers a whole load of ways to get more out of digital photos, for example: automatically make a panorama from 8 individual photos. Panorama montages automatically detect focal length, correct perspective and lens distortion. Three new style templates add extra variety. Automatic tracking shots for panoramas and portrait photos draw even more attention to slideshows. The amount of effects and transitions can be adjusted individually. The revised travel route animation feature is great for vacation photo diaries. All kinds of transport e.g. cars, boats or airplanes are now graphically displayed. The fastest route isn't always the best one, that's why routes can be customized using invisible points, curves and adjustable stopover times. Thanks to the free MAGIX Online Album, which can be directly accessed from the MAGIX Photo Manager MX interface, photos can be enjoyed everywhere, no matter if it's on a laptop, Android smartphone, tablet PC or iPhone. MAGIX is a leading international provider of high-quality software, online services and digital contents for multimedia communications. Since 1993, MAGIX has been developing leading technologies for creation, editing, management and presentation of photos and graphics, videos and music. Internationally, MAGIX operates from branches in the USA, Canada, the UK, France, Italy, Spain and the Netherlands. The product range is targeted towards laymen and professionals alike and goes beyond the PC range to include seamlessly integrated online and mobile applications. According to its retail sales figures, MAGIX leads in the multimedia software sector in Germany and the most important European markets, and is one of the most successful competitors in the USA. MX stands for Media-X-change - the idea being based around simplified media and data exchange within MAGIX programs and services. In time to come, all products of the MX Series will be able to exchange data between each other – directly from the application – and will strengthen the interaction with Cloud services, mobile devices and social networks.